President Macron at the European Council meeting, 22-23 June 2017. Photo: European Council/ CC BY. 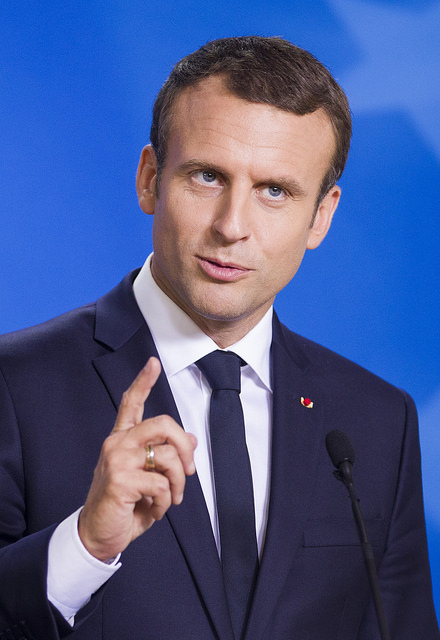 Thirty-three human rights NGOs from across Europe, the former Soviet Union and North America, as well as 13 human rights defenders from Azerbaijan have sent an open letter to French President Emmanuel Macron, urging him to help ensure the release of political prisoners in the South Caucasus country. Among those imprisoned on politically motivated grounds in Azerbaijan is opposition activist Ilgar Mammadov whose case has become a test of the legitimacy of the human rights protection regime established by the Council of Europe. The Azerbaijani authorities have persistently failed release him, although the European Court of Human Rights ruled three years ago that he had been deprived of his liberty because of his criticism of the government, in violation of the European Convention on Human Rights. Given France’s role as host country for the Council of Europe structures, its well-developed relations with Azerbaijan in trade and other areas, and President Macron’s embrace of a moral and value-based leadership, the signatories to the joint letter urge the president to use his administration’s influence and leverage to ensure justice for Ilgar Mammadov and others wrongfully prosecuted in Azerbaijan. The joint letter can be read below or downloaded here. We are writing to you on behalf of the undersigned organizations to draw your attention to the repressive free speech situation in Azerbaijan and to request your support to ensure the release of those imprisoned on politically motivated grounds in this country. In particular, we urge you to use your administration’s influence and leverage to help ensure the implementation of the ruling issued by the European Court of Human Rights (ECtHR) on the case of political opposition activist Ilgar Mammadov. He remains in prison, although the Court concluded that he was detained in retaliation for his criticism of the government. The persistent non-execution of the ruling in his case by the Azerbaijani authorities is undermining the credibility of the human rights protection regime established by the Council of Europe and sets a dangerous precedent for all those wrongfully prosecuted in Azerbaijan who turn to the Court in search of justice. In view of France’s role as a leading European state and host country for the ECtHR and other Council of Europe bodies, as well as its well-developed cooperation with Azerbaijan in trade and other areas, your engagement on this issue would be particularly important. We welcome the moral, value-based and human rights oriented leadership that you have embraced for your presidency and are confident that you will vigorously pursue human rights in relations with Azerbaijan’s government on the basis of the common standards set out in the European Convention on Human Rights. In the last few years, Azerbaijan’s government has carried out a relentless crackdown on alternative voices in the country. Legislation seriously restricting the operation of NGOs has been enforced, independent media subjected to pressure, the political opposition has been marginalized and human rights defenders, journalists and political opposition activists have been arrested, convicted and imprisoned on politically motivated charges. While some of those imprisoned on such grounds have been released as a result of international pressure, new arrests continue to take place. For example, well-known blogger Mehman Huseynov was arrested and sentenced to two years in prison on defamation charges in March this year after speaking out about police ill-treatment. Journalist Aziz Orujov and opposition member Gozel Bayramli were arrested on other spurious charges in May, while in the same month journalist Afgan Mukhtarli was abducted in Georgia only to resurface in Azerbaijani custody. Many government critics imprisoned in previous years also remain behind bars, including Ilgar Mammadov. Ilgar Mammadov, who chaired the political opposition REAL party and served as director of the Council of Europe School of Political Studies in Azerbaijan, was detained in February 2013 after monitoring and reporting on street protests in the town of Ismayilli, which resulted in clashes with the police. He was groundlessly accused of instigating these clashes and sentenced to seven years in prison on trumped-up charges of organizing mass riots and using violence against police. In a judgment issued in May 2014, the ECtHR found that Ilgar Mammadov’s arrest and detention violated his rights to liberty and security, judicial review of his detention and to be presumed innocent under the European Convention on Human Rights. The court also found that Azerbaijan’s government had imposed restrictions on his rights for purposes other than those permitted, in violation of its obligations under the Convention. The court concluded that Mammadov was detained on political rather than legal grounds for the purpose of punishing and silencing him for his criticism of the government. It has now been more than three years since the ECtHR adopted its judgement in this case, but the Azerbaijani authorities have consistently failed to implement it, although Azerbaijan is legally bound to comply with ECtHR rulings as a party to the European Convention on Human Rights. The Azerbaijani authorities have ignored repeated calls by other Council of Europe bodies, including its Committee of Ministers – which supervises the implementation of court rulings, its Secretary General and its Human Rights Commissioner to execute the judgment on Mammadov’s case. In November 2016, Azerbaijan’s Supreme Court rejected an appeal submitted by Mammadov on the basis of the ECtHR ruling and upheld his seven-year prison sentence. As a result, he continues to be unlawfully imprisoned. To date the case of Ilgar Mammadov is the only one where the relevant authorities have failed to implement an ECtHR ruling that has found that the detention of an individual violates the right to liberty and security under the European Convention on Human Rights. As emphasized in a joint statement issued by 44 members of the Civic Solidarity Platform and the Sport for Rights Coalition in May 2017, the non-implementation of the ECtHR’s judgment on this case has developed into a test of the legitimacy of the Council of Europe as the guardian of human rights and the rule of law in the region. Thus, this case is no longer only about the unlawful deprivation of liberty of Ilgar Mammadov. On the contrary, it has become a case that risks weakening the effectiveness of the entire human rights protection regime established by the Council of Europe, as well as eroding confidence in this regime among people in Azerbaijan and other member states who turn to the ECtHR when their rights are being trampled upon by their governments. Support the civil society appeal to the Committee of Ministers of the Council of Europe to refer the case of Ilgar Mammadov back to the ECtHR on the grounds of non-execution of the judgment under article 46.4 of the European Convention on Human Rights, which sets out a mechanism in cases where parties to the convention refuse to abide by a final judgment. Issue a public statement on the importance of the execution of ECtHR judgments in view of the integrity and credibility of the human rights protection regime established by the Council of Europe, giving particular attention to the failure by the Azerbaijani authorities to date to implement the ruling on the case of Ilgar Mammadov and the wider implications of this. Prominently raise the case of Ilgar Mammadov and others who have been deprived of their liberty in retaliation for their exercise of fundamental freedoms in Azerbaijan, including Mehman Huseynov, Aziz Orujov, Gozel Bayramli and Afgan Mukhtarli in relations with the Azerbaijani authorities and use all available means of leverage to press for their release. Invite representatives of Azerbaijani civil society to a meeting to demonstrate support with them and to discuss the challenges they face and ways in which your administration can help address these challenges and promote improved respect for the standards protecting fundamental freedoms set out in the European Convention on Human Rights. We thank you for your consideration of the issues raised in this letter and would be happy to provide additional information should you so request. Next articleUzbekistan: A tentative hope for human rights improvements?